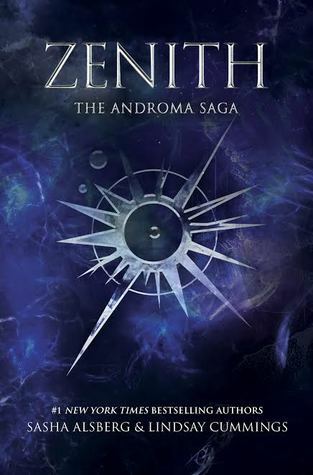 Some time ago I read the 62 page ebook that was Zenith. I thought it had potential and wanted to read the finished product. For me it fell flat, fast and hard. I give Zenith by Sasha Alsberg and Lindsay Cummings three out of five hearts because it had so much potential and it fell flat. The start of the novel was pretty slow, but it tried so hard and after a little while I it even caught my interested, but soon after that it fell again and I couldn’t be bothered to finish it if I stopped reading. The story really felt like it had the potential to be the epic space opera I had hoped it would be, but it wasn’t. Most of the story was so unremarkable I already forgot what really happened. I feel sad this has happened because I really thought it had potential and wished Sasha and Lindsay the best. I could notice Lindsay and Sasha did their best to have well developed characters but I felt that they were not giving enough information for the characters to come of the paper and they stayed as flat as the pages themselves. Overall this story has lots of potential, but it doesn’t use it. It has well developed characters but again not used. It just sometimes happens. This entry was posted in Book Review and tagged Adventure, Book Review, Fantasy, Lindsay Cummings, Romance, Sasha Alsberg, Science-Fiction. Bookmark the permalink.